Take a walk on the Ocean City Boardwalk to explore an iconic East Coast pedestrian thruway. The award-winning boardwalk is home to amazing hotels, fabulous restaurants, and attractions befitting a world class seaside resort. The Boardwalk itself is open 24/7. The businesses along the boardwalk have individual schedules on when they are open. Check with your favorite businesses to see when you can visit. 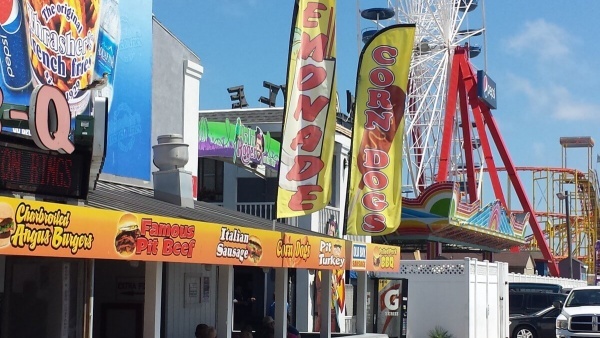 Along the boardwalk in ocean city you’ll find Trimpers Amusements, Thrashers Fries, Jolly Roger Amusements, Fisher’s Popcorn, Dolle’s Candyland, Kohr Bros. Frozen Custard, Dumser’s Ice Cream, Candy Kitchen, Dandy Don’s Bike Rentals, and Ocean City’s only Boardwalk brewery, just to name a few. The Ocean City Boardwalk is three miles long and perfect for a morning bike ride or an evening stroll. Whether during the off-season or at the height of summer there’s always something going on along the boardwalk. While it is easy to get caught up in all the great boardwalk bars, boardwalk restaurants and boardwalk entertainment, finding free things to do on the Ocean City Boardwalk is as easy as just looking around. People watching on the Ocean City Boardwalk s one of the top activities for visitors and locals alike. Since the boardwalk is dog friendly from October 1 – April 30, there are often pups and their owners to be seen pomading or sitting. The boardwalk also is a great place to catch buskers busking. Street performers of every kind, from acrobats to teenagers with guitars hold performances at all hours for your pleasure. Ocean City Boardwalk is special for lots of reasons. It’s a place people have nostalgia for, it’s a place kids look forward to visiting, and associate with summer and, for many of us, it was the place where we spent out late teenage years, playing at being grownups on vacation. Even if you’ve never been, the sights and sounds of the Ocean City boardwalk are familiar right from the first. Ocean City runs a traditional boardwalk, with games, rides and barkers right alongside the kinds of sweets and salts you’d expect. Boardwalk fries, soft-serve ice cream, and popcorn, combine in the air to add sense depth to the memories of walking along the boards enjoying the afternoon and exploring the area. Submit Your Pictures Beach Navigation There is plenty of Free parking in the West Ocean City Park and ride. There you can buy an all day bus ticket that will take you pretty much anywhere worth going in Ocean City. There’s not a ton of free parking in town but the Park and Ride is one of your best bets. The Ocean City Boardwalk dates back to 1902 when several hoteliers decided they and their guests needed a way to walk easily between their places of business while enjoying the view of the ocean. The result was a wooden walkway that was removed at high tide and stored on the hotel porches. In 1910, a more permanent boardwalk was created for the visitors and residents of Ocean City. It originally ran five blocks, but was extended to 15th Street the following decade. When the boardwalk was destroyed in the great storm of 1962, it was rebuilt to its current length, running from the inlet through 27th St., ending just before the Dunes Manor Hotel. In 2012, the Ocean City Boardwalk underwent a complete renovation whereby the old splintering and rotten boards were replaced with new wood, while retaining the old-fashioned feel of its historic past. 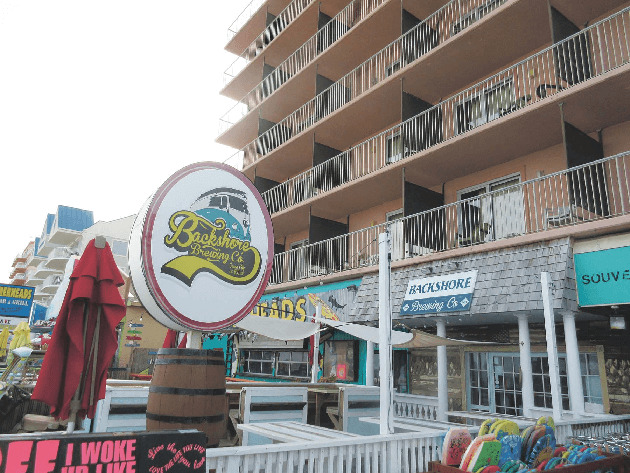 Hotels, motels, condos, and even a B&B overlook the ocean along the boardwalk. The Grand Hotel & Spa, the Park Place Hotel, the Boardwalk Hotels, some of the Harrison Hotels, the Safari Motel, as well as the Dunes Manor, which sits just beyond the terminus of the boardwalk, are just a few of the oceanfront hotels you can choose for your Ocean City vacation. If you’re looking to escape the hustle and bustle of the boardwalk, there are also numerous hotel options just off the boards on the ocean block. For a dining or drinking experience you won’t forget, try one of the many restaurants along the boardwalk. Harrison’s Harbor Watch is a local and visitor favorite because of its view of the inlet and its one of the best raw bars in Ocean City. Backshore Brewing Company has an amazing view and is located in (and behind) the Park Place Hotel. Boog’s Barbecue, which features former Baltimore Oriole Boog Powell’s award-winning recipes, borders the inlet parking lot, just around the corner from the world famous Thrasher’s French Fries. When it comes to live music and iconic venues, Ocean City’s Purple Moose Saloon, located at the top of Caroline St. on the boards, is second to none. The Grand Hotel's Epic Bar & Grill features a full bar and cheap grill snacks. Starting at the inlet, you will find stores that offer specialty pet stores, museum stores, jewelry stores, many t-shirt shops, surfing stores, and much more. The most famous boardwalk amusement can be found inside Trimper’s along the inlet parking lot. The Trimper’s Carousel has been giving children and adults rides since 1912, making it the oldest continuously operating carousel in the country! The two-tiered Herschel-Spellman Venetian style merry-go-round was built in 1902 with elaborately painted animals as well as benches for the young or old. All will love the mirrors, decorations, and whimsy of this beautiful icon of Americana, making it well worth the trip – and the price! Trimper’s may be one of the main attractions, but there are also of other amusements and activities for the whole family. The old Pier Amusements is now operated by Jolly Roger and is home to many famous rides, including the Slingshot, 1001 Nights, Tornado, Looping Roller Coaster, Giant Ferris Wheel, Hurricane, Crazy Dance, Morbid Manor 3D, bumper cars, Bear Affair, Rockin’ Tug, Family Himilaya, and Ripley’s Mirror Maze. If you’re not in the mood for rides, you can enjoy the midway games or souvenir shops as you stroll along the inlet area. Ripley’s Believe it or Not, marked by the giant mechanical shark emerging from the buildings destroyed siding, caps the end of the building where Jolly Roger and Trimper’s are located. This oak carving of an Assateague Indian was presented to the people of Maryland by the artist, Peter Toth, in 1976. The artist has donated totem carvings to each of the 50 states over the years. The tree from which Peter carved this member of the Assateague Indian tribe, a subset of the Nanticoke who still live in this area, was over 100 years old. Construction on this tower began in 1934 to stand watch for the life-saving station and to watch for German U-boats during World War II. 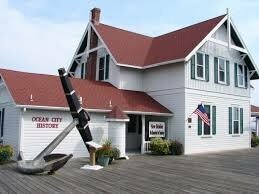 While not open to the public, this five-story structure stands sentinel to the Ocean City Inlet and adjacent to the Ocean City Life-Saving Station Museum. This building was constructed in 1926 where it replaced a building finished 1907. The second floor was originally a ballroom. The original building contained a dancing pavilion, skating rink, bowling alleys, pool room, and refreshment booths.